By Garett Sloane . Published on June 28, 2017. Food Network is showing recipes and cooking demos through the new Echo device. Streaming video services are sometimes called "over the top" because they skip over the cable box to reach consumers. Now publishers are going over the counter top with original programs for the new Amazon Echo that comes with a screen. 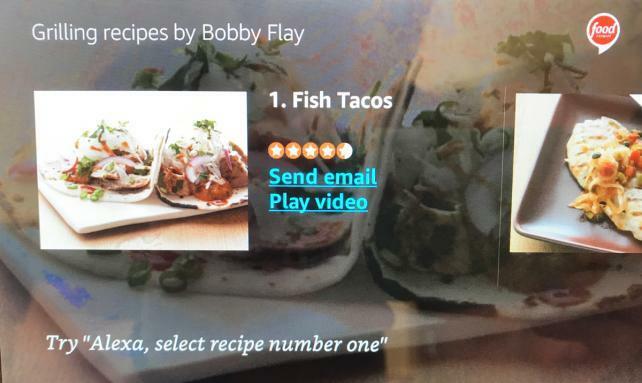 On Wednesday, Scripps Networks Interactive' Food Network and Time Inc.'s People introduced apps for the device, called the Amazon Echo Show. "It actually solves one of the key challenges consumers have with voice alone, which is you can't look at it," said Al Ming, director of product management for Scripps Networks websites, apps and emerging platforms. "If you can't look at it, you're probably not going to decide to eat it." That's why Food Network upgraded the skill it created for the original Echo, which let people ask the virtual-assistant "Alexa" for recipes form the Food Network, which would then be e-mailed. Now the Food Network can stream cooking demos right to the device. The publisher is looking at it like another over-the-top video channel. "We already have the data and structure for mobile apps, websites and connected TV apps," Ming said, which made developing or the Show simple enough. The Food Network only reached about 600 people daily through the original Echo, Ming said. "The conversation is more around what the future holds," Ming said. "It starts with building up the audience and seeing what the consumer behavior is on these platforms, because it is so new." Amazon does not disclose how many people own an Echo and talk with "Alexa," but it is the leader in the home-assistant space with 70% of the market, according to eMarketer. Google's Home is already on the market, and Apple is getting ready to start selling the Siri-based HomePod in the fall. Neither competitor has a screen, which could keep Amazon in a position of strength. "Amazon owns much of the marketplace," said Regina Buckley, senior VP-digital operations and business development as well as general manager for lifestyle at Time Inc. That's why People is more developed on Echo devices, and was ready to whip up a video show when the screen arrived. "We did a very 'Time Inc.' assessment of the space," Buckley said. People created a "flash briefing," which streams a short celebrity lifestyle program hosted by Jeremy Parsons to the video screen. With audiences still limited and ads not included, media companies will have to get creative to figure out how to make money from home assistant channels. Buckley said there will be opportunities for brands to become part of the content.